Zack Ruskin: Many child narrators in literature come off sounding far too smart for their age. In Room, you manage to make Jack, this five year-old boy, sound wise and naïve, without being precocious. How did you make your writing fit that particular point of view? 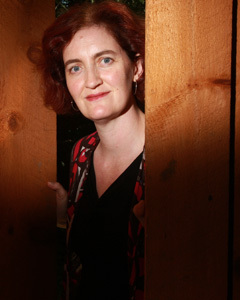 Emma Donoghue: I studied my son (who was five), then extrapolated from there, because I figured Jack would be quite a bit ahead of him due to his hot-house environment. I was careful to distinguish between vocabulary and grammar: kids getting lots of conversation with adults can pick up their words, but not their grammatical structures, so Jack has some fancy multi-syllabic words but also many of the typical mistakes of a five-year-old. To anyone who writes to complain of an inconsistency, I answer, real children are consistently inconsistent! ZR: By the end of Room, we’re never told Ma’s real name. What was the catalyst for that choice? ED: No name sounded right for me, even when I drew up a long list. Then I realized Jack was vetoing them. He refuses to tell the reader Ma’s ‘other name’ because he doesn’t want her to be called anything but Ma. That was the challenge of Room, for me: to make Ma vivid and real despite Jack’s very narrow lens on her. ZR: In building the architecture of Room in your mind, how did you select the few items Jack and Ma would have access to? ED: I figured Old Nick would have designed it for ‘one sedentary user’, as he puts it sanctimoniously. I ‘shopped’ on ikea.com, picking roughly the second-from-cheapest of everything, and used another home design website to move all the pieces around. This interview appeared on the Book Passage blog on May 27, 2011.